Langkawi (Malaysia) – August 15, 2018 (travelindex.com) – Fifteen of the most innovative start-ups have been invited to the World Tourism Forum Lucerne (WTFL) Start-Up Innovation Camp 2018 taking place at PATA Travel Mart 2018 (PTM 2018) on September 12 in Langkawi, Malaysia, where they will have a unique opportunity to pitch their business model and convince international investors to help make their vision a reality. For the third time and the first time in Asia, WTFL is organising the Start-Up Innovation Camp with the aim of promoting new and innovative business models in the travel, tourism and hospitality industry. Start-ups had the opportunity to apply in five different categories: Transaction, Hospitality, Destination, Mobility, and Impact. With applications from over 200 young entrepreneurs from 54 different countries, the 15 best start-ups of each category were pre-selected by the international jury and have been invited to pitch their business in front of a jury of international investors and industry executives. The winner of each category will be awarded with USD15,000 Start-Up Innovation Award 2018, 2-year coaching programme, and “5 Minutes of Fame” in front of a high-ranking international audience. WTFL Chairman of the Jury Roland Zeller, a leading entrepreneur and business angel, is positively surprised by the amount of innovation start-ups deliver each year. Overwhelmed by the number of applications and spectrum of nationalities, the jury had a difficult task to select the most promising business models. However, the following 15 start-ips succeeded in convincing the jury the most, above all by their innovative thinking and vision. “Particularly in these times of structural changes and challenges, innovation is a key factor in the long-term competitiveness of companies,” said Mr. Zeller. 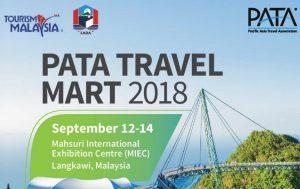 Founded in 1951, PATA is a not-for-profit membership association that acts as a catalyst for the responsible development of travel and tourism to, from and within the Asia Pacific region. The Association provides aligned advocacy, insightful research and innovative events to its member organisations, comprising 98 government, state and city tourism bodies, 19 international airlines and airports, 91 hospitality organisations and 70 educational institutions, as well as over a hundred young tourism professional (YTP) members across the world. The PATA network also embraces the grassroots activism our 36 Chapters and 20 Student Chapters across the world. Thousands of travel professionals belong to the 36 local PATA chapters worldwide, while hundreds of students are members of the 20 PATA student chapters globally. The chapters and student chapters organise travel industry training and business development events. Their grassroots activism underpins PATA’s membership in Uniting Travel, a coalition of the world’s major Travel & Tourism organisations dedicated to ensuring that the sector speaks with one voice and acts in unison on the major issues and includes ACI, CLIA, IATA, ICAO, WEF, UNWTO and the WTTC. The PATAmPOWER platform delivers unrivalled data, forecasts and insights from the PATA Strategic Intelligence Centre to members’ desktops and mobile devices anywhere in the world. PATA’s Head Office has been in Bangkok since 1998. The Association also has official offices or representation in Beijing and London. Visit www.PATA.org. World Tourism Forum Lucerne (WTFL) is a unique platform for CEOs, Ministers, Academia, Investors, Start-Ups and representatives of tomorrow’s generation to actively exchange, share, and address the future challenges of the travel, tourism and hospitality industry and to shape a more sustainable future. Want to find out more? Visit our website www.wtflucerne.org.